The Walworth County Executive Committee unanimously passed a resolution Monday supporting the county’s treatment court programs, which the district attorney has recently called into question. Committee members asked District Attorney Zeke Wiedenfeld where his opposition was coming from. Wiedenfeld said he would like more explicit criteria over who can and cannot enter the drug court program, such as what exists with OWI court, which allows in third- and fourth-offense intoxicated driving offenders. The absence of such criteria has led to conflict, he said. Judge David Reddy, who oversees treatment courts, said at a February meeting only two of the 69 people who were in drug court at the time came into the program against the recommendation from the DA’s office. Reddy and other county judges—some of whom have said their minds changed after running the programs firsthand—said they are in favor of keeping treatment courts. Wiedenfeld has said he supports treatment overall but that anyone who wants it can go to the county’s Department of Health & Human Services. Executive Committee Vice Chair Charlene Staples countered, saying attendees would need money or insurance coverage to pay for it. Wiedenfeld said he thought the department takes income into consideration. Staples said she didn’t understand Wiedenfeld’s broader argument, adding she did not believe drug court should have the same hard-and-fast criteria as OWI court. She also said she did not believe judges would add a dangerous criminal to the program just to keep its numbers up for grant funding. While Wiedenfeld withdrawing his support alone might not end treatment court programs, other have said his participation is necessary. The county’s top prosecutor said he is “not going to promise there’s gonna be a solution,” but the sides are working to resolve their differences. He later said he is “hopeful” they can work out a resolution. Clerk of Courts Kristina Secord said she thinks it is “critical” to keep treatment courts. She said research shows better outcomes for participants and cost savings in the “millions” for the county since 2011. While Wiedenfeld has said he has public safety concerns, committee member Dan Kilkenny said it would appear it is safer for the public for someone to be in treatment court rather than be out on bond while a case is pending. Kilkenny also said the committee should consider whether the community would be better off if a person being released from jail had been through treatment. He also highlighted the need for evidence-based decision making. Committee Chair Dave Weber said it seems to him that the program offers more positives than negatives. He also said the county has supported the programs since their inception. County Board Chair Nancy Russell is on the executive committee and the Criminal Justice Coordinating Committee, a meeting of which was where Wiedenfeld first questioned the role of treatment court in public. She said Monday she wanted to make clear the judges and sheriff “are in favor” of treatment courts. She said taxpayers should support them, too. 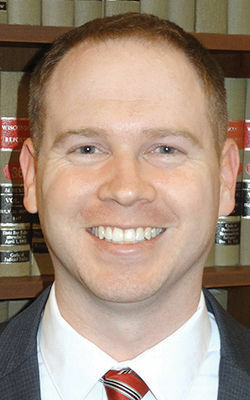 Walworth County District Attorney Zeke Wiedenfeld’s office has charged more felony and misdemeanor cases than the county has seen since the mid-2000s—even though arrest figures have been declining.